It's January, and we are eating local fruit -- Reed Valley Orchard's apples and applesauce. The crisp acid-sweet taste brightens and lightens any plate of food I cook. Slow-cooked beans, egg-y frittatas, beef brisket, country ham. Or, to be honest, applesauce in a bowl all by itself brightens ME. 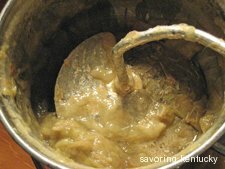 If Savoring Kentucky were an opera, applesauce would be a motif, so often do I return to touting it. Adding to the apple motif, this year I bought extra Gold Rush apples and a few Granny Smiths, to store in my refrigerator's produce drawer, as directed by Trudie and Dana Reed, for eating out of hand. Two months into the experiment, the apples are wonderful. I wish I were eating one right now! The Gold Rush keep their firmness and their extraordinary sweet-tart intensity. I have used the Granny Smiths primarily for cooking, though they have stayed firm and juicy as well. This week I roasted two Grannies using a method long-time Chez Panisse chef David Tanis suggests in his recent cookbook, A Platter of Figs. Don't you think any food preceded by the adjective "roast" or "roasted" automatically gets 10 extra appeal points? These roasted apples tasted fine, mainly because the apples themselves taste so fine. Project Foodie has posted the recipe here. I am happy about having last summer's apples this winter, but freshly roasted (aka "baked") apples and newly made applesauce will taste delicious if you can locate some flavorful Granny Smiths at a nearby store.